Poké Balls are important items originating from the Pokémon series; their purpose is to store and mobilize Pokémon within the ball when they are not in battle. They have appeared in all six installments of the Super Smash Bros. series as items, and serve as the Pokémon series emblem. When thrown, the Poké Ball releases a random Pokémon out of the ball, which says its cry and attacks. In Super Smash Bros. Brawl and Super Smash Bros. Ultimate, the Pokémon Trainer uses a Poké Ball to change between his three different Pokémon: Charizard, Squirtle and Ivysaur. In Super Smash Bros. for Nintendo 3DS / Wii U and Super Smash Bros. Ultimate, the Master Ball variant of Poké Ball appears as an item. They specifically release only rare and Legendary Pokémon, while the regular Poké Ball can release any Pokémon. 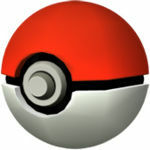 For a complete listing of Pokémon coming out of Poké Balls, see the Pokémon article. DS Pokémon Diamond/Pearl An item used for capturing Pokémon and calling them out to battle. Pokémon live in these items which, despite appearances, actually contain a wide, comfortable, Pokémon-friendly world inside them. In Super Smash Bros., Pokémon give temporary support to whoever calls them out. You never know which Pokémon you'll get, but some of them are devastatingly powerful. 3DS Pokémon X & Pokémon Y (10/2013) NA: An item used to call out different Pokémon. Which Pokémon emerges is a mystery, but it will aid whoever threw the Poké Ball. Some of the Pokémon contained inside are extremely powerful and will really intensify the battle. It's definitely worth beating your opponents to these! EU: A ball holding one of any number of Pokémon just waiting to burst out and help you in battle. Which kind will it be? Well, that's a surprise, but whichever one it is, it'll definitely up the intensity of the battle! If you see one, make sure you're the one to grab it! In Super Mario Galaxy, there is a spherical planetoid in the Buoy Base Galaxy which resembles a Poké Ball when viewed upside-down. This page was last edited on April 9, 2019, at 22:33.